Overnight oats are an ideal breakfast-to-go. Prepare this recipe in just five minutes the night before and wake-up to a deliciously healthy breakfast for mornings when time is running short. This easy recipe evokes the nostalgic flavors of peanut butter and jelly sandwiches, with sweet fresh cherries and a hit of protein from unsweetened peanut butter. The creamy oats are just slightly sweetened with honey, and chia seeds add fiber, antioxidants and protein. Try different berries or stone fruits when they're at peak season during spring and summer! To make this recipe vegan, use plain coconut yogurt and nut milk, and replace the honey with agave. To keep the sugar low, be sure to use plain yogurt and unsweetened peanut butter. Try swapping the honey for maple syrup for a slightly different flavor. Per Serving: 685 calories; 30g fat; 86.0g carbohydrates; 25g protein; 14mg cholesterol; 409mg sodium. LOVE the combination of filling oats, protein packed yogurt, sweet fruit to jump start the morning! I like to eat these overnight oats cold in the summer and warm in the winter. Nice addition with the cherries, too. Sometimes we strawberries, but the cherries are our favorite. This is a good, easy recipe my wife and I both enjoy. 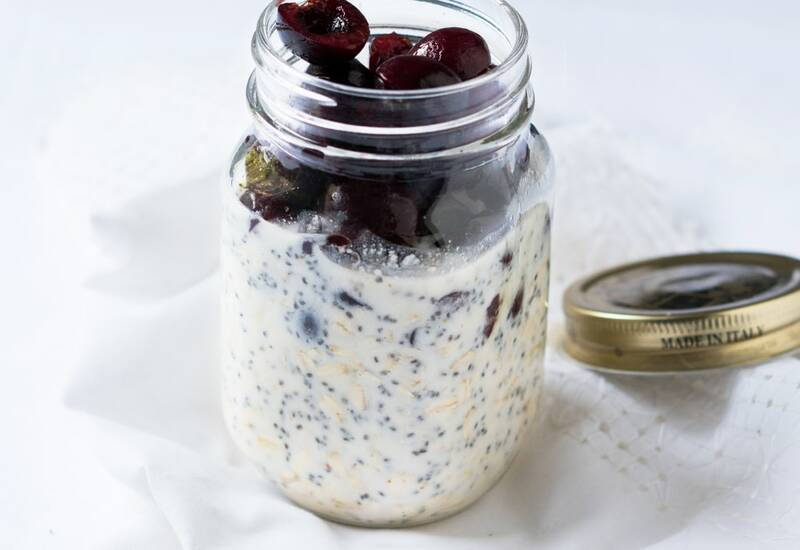 I've made overnight oats so many times, but never with cherries! This is now my new favorite combination. I don't know why I never though of it before! The chia seeds are great to help thicken up the consistency some. Love, love, love! Can't wait to make again tomorrow! I did cherry and banana combo, and it was really good. However, I had to warm the peanut butter in the microwave in order to get the drizzle effect. Super quick and easy, I'm gonna do this again for my meal prep this week. I made this recipe because I wanted something convenient for breakfast. I don't know if I am really saving myself that much time though because I still warm it up in the microwave the next morning. If you don't mind eating it cold, then it's super convenient, just grab and go. I've made it a few days in a row, each time adding a different fruit topping!